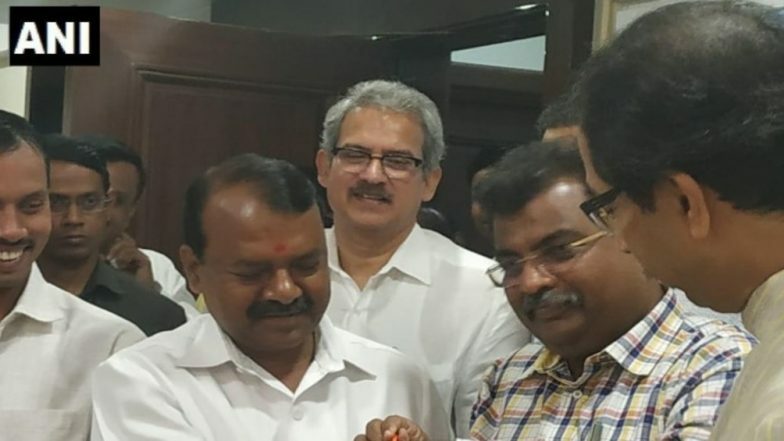 Palghar, March 26: Bharatiya Janata Party's sitting MP from Palghar Lok Sabha, Rajendra Gavit joined Shiv Sena on Tuesday. Shiv Sena Chief Uddhav Thackeray while welcoming Gavit into party said that he will be Sena’s official candidate for the Lok Sabha seat. The Palghar seat, allotted to Sena as a part of BJP-Sena, had reported created discontent among BJP workers. Maharashtra Lok Sabha Elections 2019 Dates: Constituency-Wise Complete Schedule Of Voting And Results For General Elections. Gavit, who joined BJP in May 2018, was elected from Palghar's seat last year following the death of BJP's then MP Chintaman Wanga. In the bypoll, Shiv Sena fielded Sriniwas Wanga against the BJP candidate, but lost the election. Shiv Sena 1st List of Candidates For Lok Sabha Elections 2019: 21 Leaders From Maharashtra Named, Check Full Constituency-Wise List. “Since there is only one opposition candidate, it will be a tough fight and we needed a strong candidate. So, we have offered Gavit to join the Sena and to contest on Palghar Lok Sabha seat,” a Sena leader told to The India Express. Meanwhile, Bahujan Vikas Aghadi (BVA) led by Hitendra Thakur has fielded Baliram Jadhav, a former MP from the seat. BVA is a part of the Congress-NCP and CPI(M) alliance.